Ask any volunteer or devotee and we’ll tell you likewise. A good charity shop can be a community hub, a social support network and a port in the storm to while away an idle half hour. They spark unlikely meetings and lively debate in a way that the average fast fashion outlet rarely can. In a charity shop everyone’s welcome, regardless of background or budget, free from pressure, scrutiny or the glare of an underworked sales assistant. They’re about so much more than just clothes. But of course, the clothes matter too. And with a new mood of conscious consumerism in the air, there’s never been a better time to step off the fast fashion treadmill and embrace slower, more sustainable shopping. Just as last year saw ‘single-use plastic’ enter the vernacular, and worried Londoners began switching to travel cups quicker than you can say ‘oat milk macchiato’, 2019 may see a turning of the tide on the way we think about getting dressed. It has to. The stats are alarming: around 300,000 tonnes of textile waste are thrown away each year in the UK, with £140 million-worth ending up in landfill, and only one per cent recycled. With the fashion industry reported to be the planet’s second biggest polluter (after oil), shoppers are beginning to wake up to the true cost of all those hardly-worn outfits languishing in the back of the wardrobe. Dressing well, we are realising, shouldn’t cost the earth. But there’s an answer, and you’ll find it on Marylebone High Street, among the neighbourhood’s salubrious boutiques and minutes from Oxford Street’s hordes of tourists toting Primark bags. Cancer Research UK has had a makeover. Already one of 35 premium stores among the charity’s 600 UK outlets, the shop has been chosen as the guinea pig for a new ‘boutique’ concept, hoping to reel in more style-savvy shoppers. Now, at first glance, you might not even realise it’s a charity shop. In the window there’s a traffic-stopping, tomato red vintage suit. The label? Dior. On the walls, a photoshoot that looks fresh out of a Sunday supplement magazine. And on the racks, Louis Vuitton, Gucci, Céline and Alexander McQueen nestle up against Whistles, Mango and & Other Stories. There are homewares, both the new and the charmingly retro, and even the air is fragranced—not with the musty tang of yellowing paperbacks, but a fig-scented reed diffuser. But it’s the misconceptions that are outdated, not the stock. Cherry-picked by staff and volunteers with an eye for quality and detail, the new boutique sells a selection that ranges from last season’s high street to half-a-century-old heritage vintage. As in most charity shops, everything is meticulously steamed and checked for flaws before it hits the shop floor. So, you can un-wrinkle your nose, thank you. Last year, Cancer Research took in more than 4.4 million bags of items that could otherwise have been sent to landfill. But for 21st century charity retail, the biggest challenge isn’t drumming up donations—it’s keeping everyone happy. Shops need to cater for loyal regulars, many of whom buy secondhand out of necessity rather than choice, while also drawing in a new, fashion-forward customer base. “Some people don’t consider charity shopping to be ‘something for them’,” says Emma Slade Edmondson, a creative director and consultant specialising in ethical retail, and one of the brains behind Cancer Research’s new look. She blames a generation bred on fast fashion and a craving for “constant newness”, Saturday night outfits from bargain retailers which are now so cheap, they’re almost as disposable as those coffee cups. Together with interior designer Nadia Themistocleous, Emma worked her magic on Cancer Research UK to create “the ultimate feelgood shopping experience”. All brushed brass hardware, modernist light fittings, blush pink walls and on-trend terrazzo surfaces, the result is a calming, polished space with room to breathe. Less clutter, more mirrors, pink velvet fitting room curtains that actually function properly. An all-important chair for weary, shopped-out spouses. And a large central table, used for display by day, which could soon host evening events. It seems Marylebone’s on board. Tills are ringing (or rather, card readers are bleeping), the shop’s weekly sales total is well above average and customer praise spills forth on social media. “Our aim is to increase awareness of the role we can play in reducing consumption of new goods, and to encourage younger fast fashion fans to consider shopping in charity shops—or at the very least donating their unwanted items to charity,” says Julie Byard, director of trading at Cancer Research UK, who hopes to roll out the boutique concept to more stores across the UK soon. Up the road at the Barnardo’s Shop on George Street, it’s a similar story. “We’ve revamped our Marylebone store to reflect the look and feel of the surrounding community. It now emanates a modern yet eclectic feel, showcasing amazing one-off pieces around the store,” says Laura Grant, assistant director of marketing and communications for the charity’s retail arm. A quick flick through the Barnardo’s rails throws up Reiss knitwear, Pringle cashmere, Joseph, Jaeger and a Zara dress that’s a dead ringer for 1960s vintage (this is the special trick of charity shops—items you wouldn’t give a second glance on the high street suddenly look cool and alluring without context). Here too, the traditional ‘pile ’em high’ approach has gradually been swapped for space to browse, with curated displays and a glass case which houses the most premium treasures. It’s an approach that Mary’s Living & Giving Shops for Save The Children have been using since 2009, masterminded by retail guru Mary Portas, with a new breed of airy charity ‘boutique’ now popping up across London in their wake. Last month saw the opening of Boutique by Shelter at Coal Drops Yard in King’s Cross, designed by slow fashion and sustainability champion Wayne Hemingway. All polished concrete, millennial greenery and industrial-chic fittings, the space sits comfortably alongside neighbours like Paul Smith, Cubitts and Cos. But more importantly, as a hunk of prime real estate in one of London’s coolest new developments, it represents an exciting sea change for the sector. Because while shoppers from all walks of life might love a good charity shop, councils and developers have tended to view them as a marker of deprivation—until now. Still, there remains a lot of love for the traditional charity shop too; the charmingly chaotic, jumble sale type where you might find a secret heirloom buried beneath a flurry of 1980s St Michael. Anyone who has rootled around in George Street’s enigmatic Geranium Shop, run by Greater London Fund for the Blind, will probably agree. “It’s important that people know that bargains can still be found,” says James Johnson, deputy manager of Oxfam Marylebone, who spends his days sorting through a wealth of high-end, vintage and high street donations. Dolce and Gabbana, Chanel, Jimmy Choo and Christian Louboutin all find their way onto the colour-coordinated racks, alongside print midi dresses from Diane Von Furstenberg and niche New York label Suno. But if a £3 silver bumbag is your heart’s desire, you can find that too. James tells me that growing awareness of the preloved market is gradually drawing in a younger crowd. 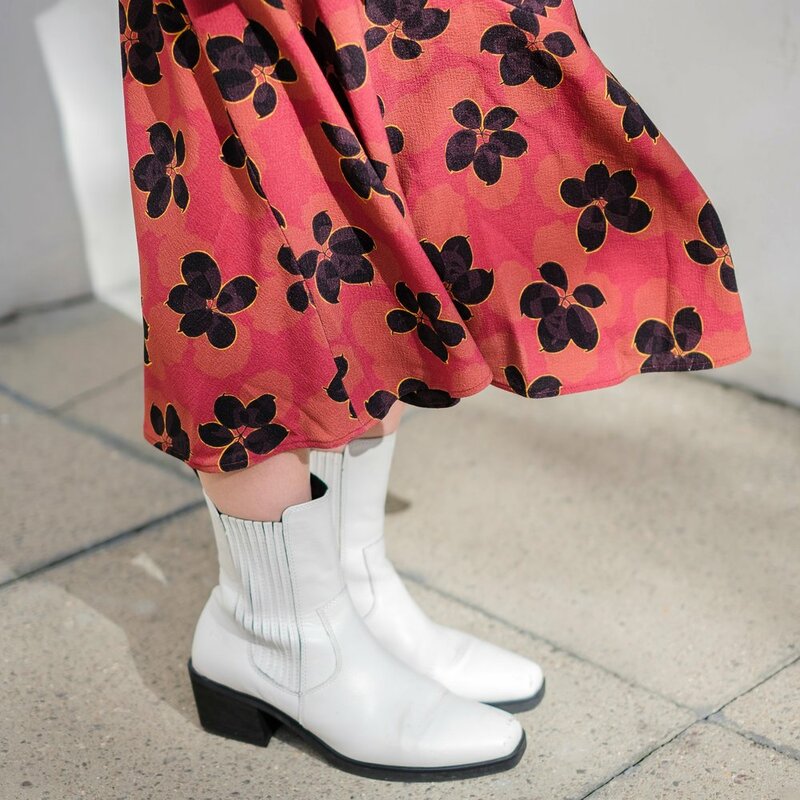 “They understand that even if high end labels are not necessarily cheap, they represent great value.” If ‘quality over quantity’ is going to be our new shopping mantra, then charity shops have the power to level the playing field and give us all a sartorial knees-up. Then there’s the element of luck and destiny. In our age of excessive choice, where we complain of ‘decision fatigue’ and streamline our lives to reduce ‘cognitive overhead’, secondhand shopping is a mindful no-brainer. You either find something, or you don’t. It either fits you, or it doesn’t. And if it doesn’t... well, you grit your teeth and tell the next person how lovely they look in it instead. “Charity shops are one of the few areas in life at the moment where you still have the thrill of the chase,” says Paul. Back at Cancer Research UK, he’s taking me on a tour of the shop’s basement stockroom. Upstairs might be all edited calm, but downstairs, like the proverbial swan, is where the hard graft happens. There are bags and bags of donations, all sorted and filed by colour, season, style or price point. Staff and volunteers have to think on their feet, rotating stock with other stores every couple of weeks and listening to customer demand. “We have the ability to buck a trend, to stand out, to do something that’s not seasonal,” he says. Victoria Beckham’s London Fashion Week show in February prompted a line of mannequins in roll neck jumpers and wide-leg trousers. Unlike high street chains, charity shops can be responsive—whether that’s led by the red carpet, or the weather forecast. Freak April snowstorm? They’ll be the only ones on the street with a window full of scarves and ski jackets. But just like the perfect outfit, charity shops are also an exercise in balance. The old with the new, traditional with trendy. The loyal, regular customers with a new influx of label-loving magpies. Both running them and shopping in them can be a labour of love, but it’s worth it. Because while a ‘new’ dress might give you a buzz for a day or two, charity shops spread good vibes in every direction. The cause, the community, the planet, your pocket—everybody wins.